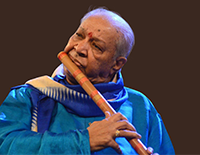 Pandit Hariprasad Chaurasia, renowned exponent of the bansuri or bamboo flute, is a rare musician, earning several national and international awards, including the Padma Bhushan, Konarak Samman, Padma Vibhushan, Dinanath Mangeshkar Award, OFFICER IN THE ORDER OF ORANGE-NASSAU by the Dutch royal family and KNIGHT IN THE ORDER OF ARTS AND LETTER by the French Government. He has collaborated with several western musicians, has performed worldwide and has been teaching Indian music at the Rotterdam Music Conservatory for the past 15 years. He is the Artistic Director of the Indian Music department.